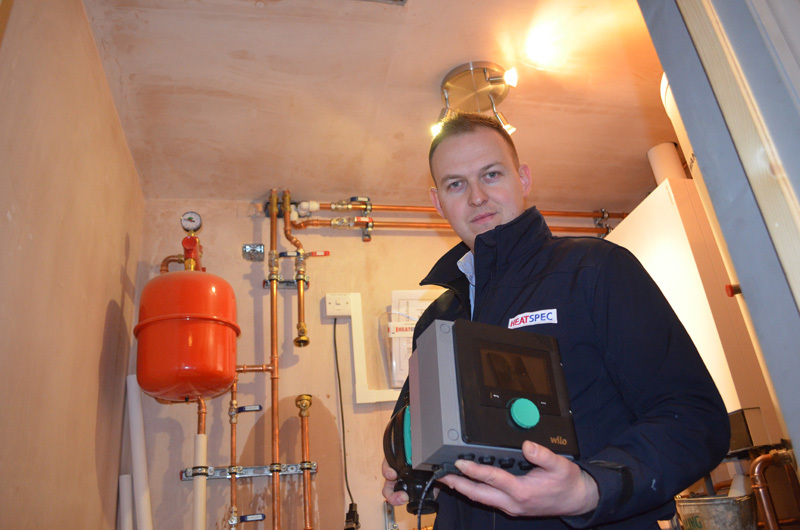 PHPI gets the lowdown on the features of the smart Stratos-MAXO from Wilo, and heads to Leicestershire to track an installation of the new pump. What does the word ‘smart’ actually mean? The phrase has a tendency to drop off the tongue with a little too much ease these days. In particular, what does ‘smart’ mean in connection with today’s pump technology? Is it simply clever? Or is it more than that? 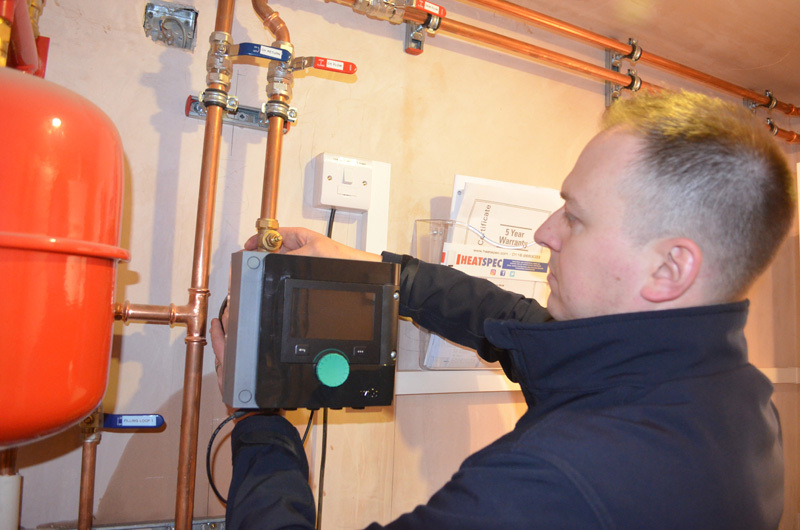 Wilo believes the smart pump offers greater efficiency, connectivity and comfort, while also featuring an intuitive user interface that makes installation and operation easier for installers. The pump’s energy-saving functions and new control modes have been designed to attain greater system efficiency and the highest level of compatibility with existing systems. 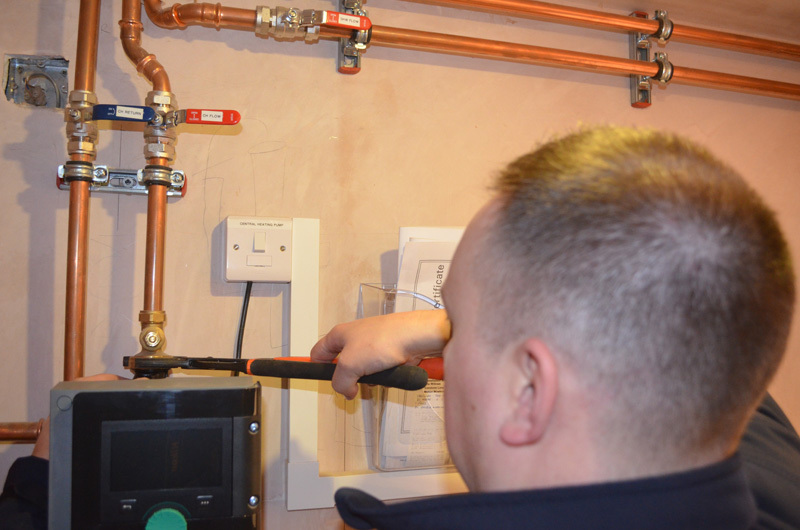 PHPI was able to witness one of the first of these new pumps being installed in a seven-bedroom, three-bathroom property in the Leicestershire countryside. 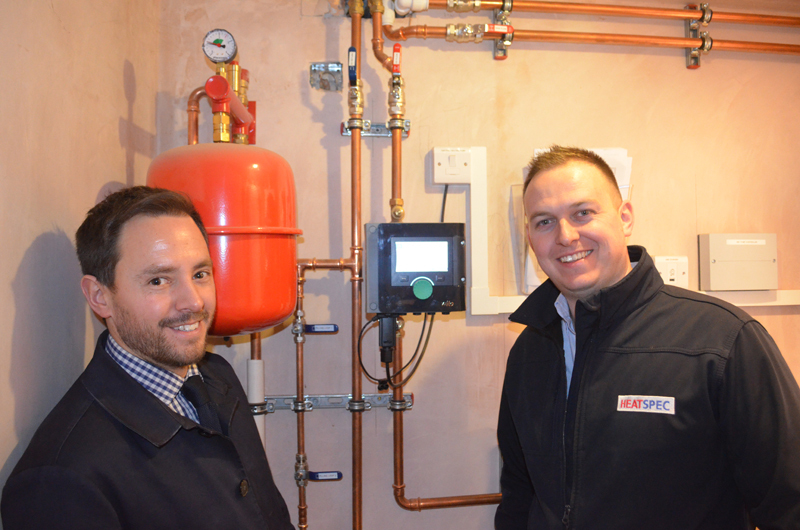 The Stratos-MAXO serves a heating system that includes a Viessman Vitodens 200 system boiler, a Viessmann Vitocell domestic hot water cylinder, a Spirotech SpiroCross low loss header unit, and a Flamco expansion vessel attached to the Flamco Flexconsole Plus with an integrated Flexvent safety pressure valve. 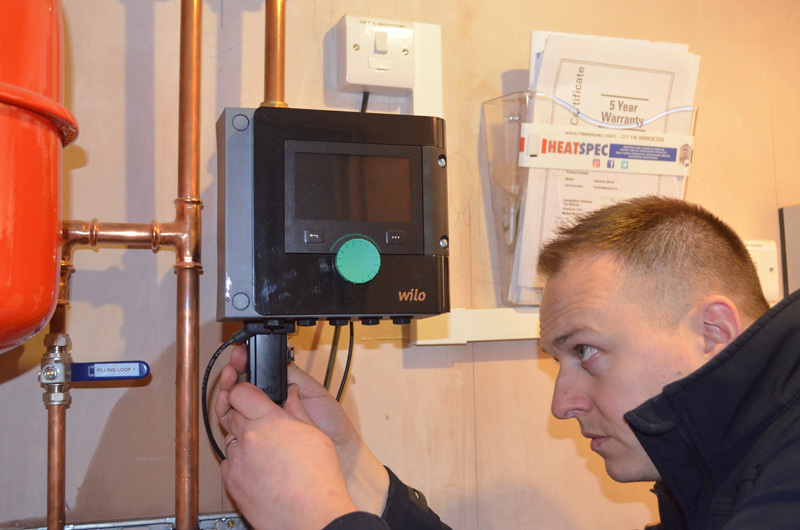 The installation was carried out by Glen Wakeling from HeatSpec, an installer company based near Leicester, with Wilo’s Justin Smith in attendance. Glen with the new Wilo Stratos-MAXO prior to installation. 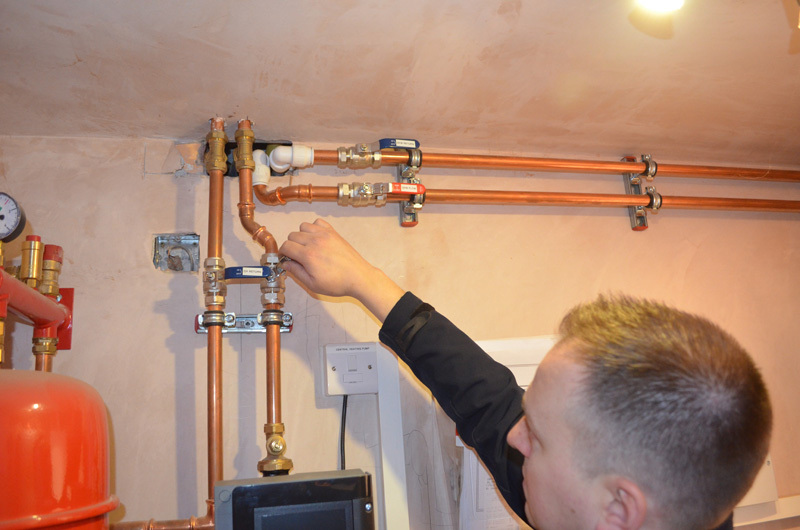 The pipework has already been completed to accept the new pump. Glen offers the pump up to the unions and finger tightens the fixings top and bottom. Glen offers up the Wilo Connector – designed to make connection as simple as possible. The clips attach the Connector to the pump securely without any complex connecting required. Glen tightens the gate valve union above and below the pump. Then he opens the gate valve above and below the pump as well. The pump is now installed, so Glen opens up all the valves to allow the water to circulate around the system. Justin and Glen use the Green Button technology to set the pump up. 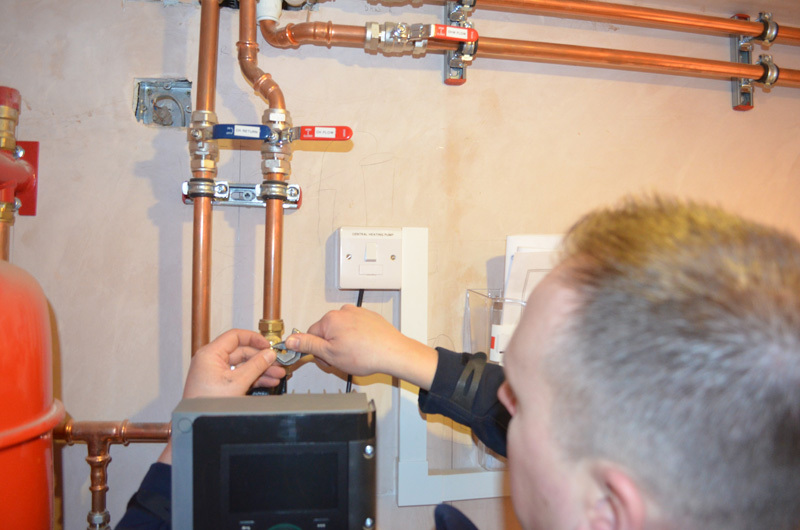 In this installation the pump is connected to the boiler, with much of the settings prepared via the boiler software. 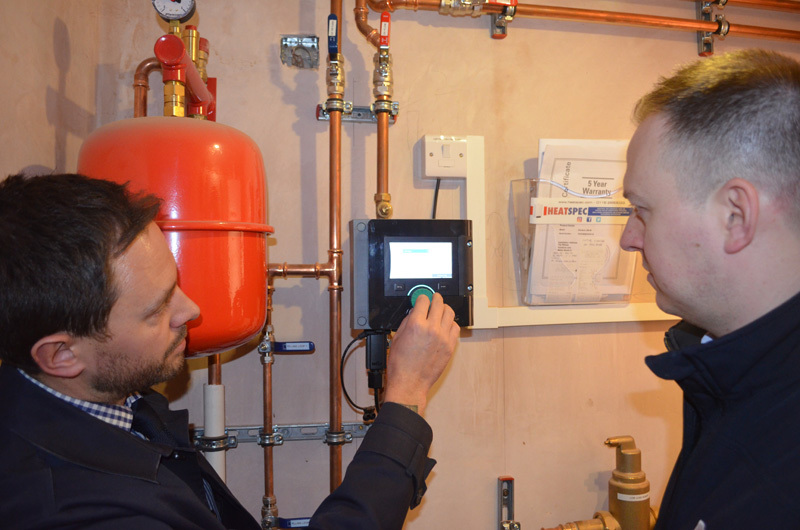 The pump automatically responds to the requirements of the boiler.